Satara Fort on hilltop. Residency with Union Jack and other bungalows at foot of hill. 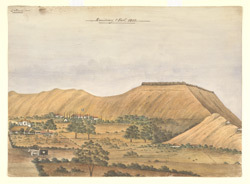 bl.uk > Online Gallery Home	> Online exhibitions	> Asia, Pacific and Africa Collections	> Satara Fort on hilltop. Residency with Union Jack and other bungalows at foot of hill. Satara is situated in Maharashtra in a valley between two hills near the confluence of the Kistna and Verna rivers. The British established a cantonment here that contained the old Residency (1820) which was used in 1849 by the British colonial administrator, Sir Henry Bartle Frere (1815-1879). It has been suggested that the fort was built by the Silahara Dynasty and later strengthened by the Marathas, who made it the capital of their empire. The walls of the fort are four metres high and there are many water tanks within the fort.